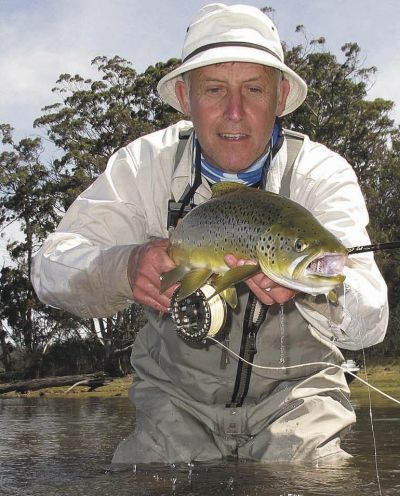 I like catching fish on a dry fly just as much as the next person and will often persist with floating flies early in the season, experimenting to try for a response, . I know that I will get refusals and catch less doing this, but for me this is not a numbers game. 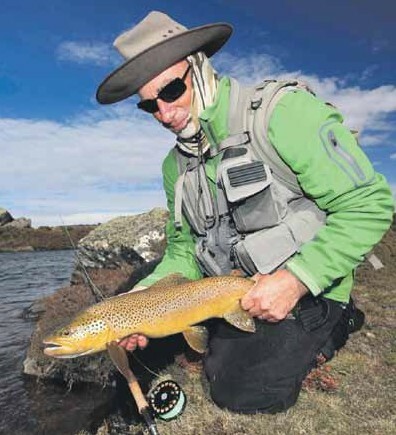 Success or failure with any fly can vary from water to water in the Western Lakes, as each location can be vastly different from the next. What fish feed on can change from lake to lake or from shore to shore depending on the make up of each lake, the food within it and the effects of rising or falling water levels. The trick is to find a fly and technique that will trigger a response from them more often than not. 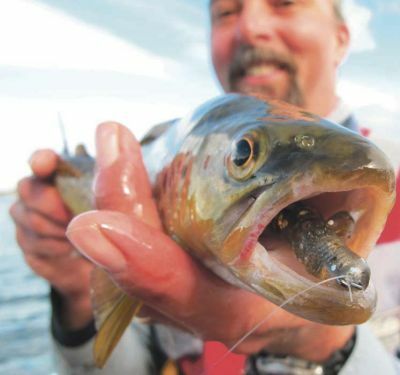 Sometimes it comes down to finding a single fish that is willing to take a chance and open and close its mouth onto a fly that vaguely resembles a potential feed. There was a time when I thought Great Lake was a barren and unappealing body of water. My opinion soon changed as I discovered the existence of midge feeding trout out in the middle of this Lake back in the late 80’s after reading Robert Sloane’s classic book “The Truth About Trout”. 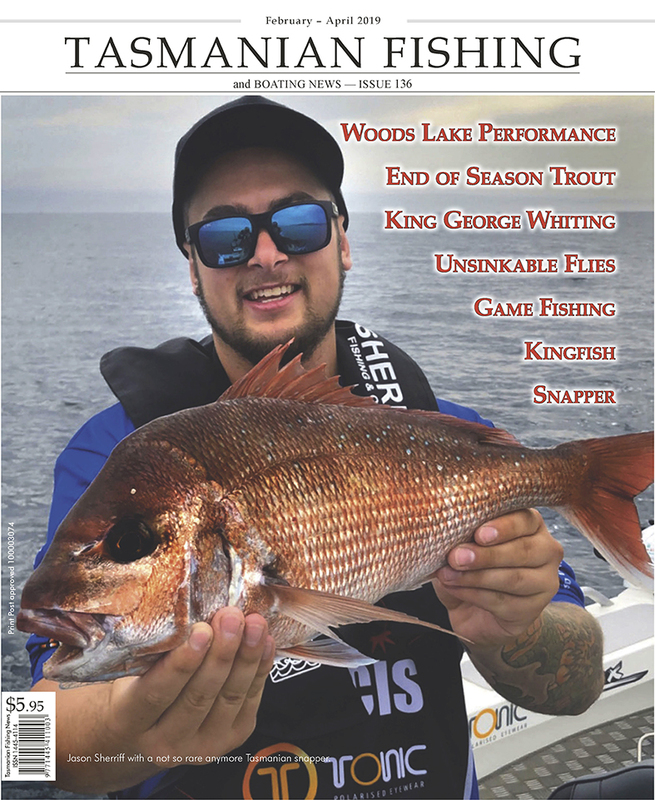 Since then, there have been many new publications from very competent anglers who have spent a lot of time unlocking its secrets. 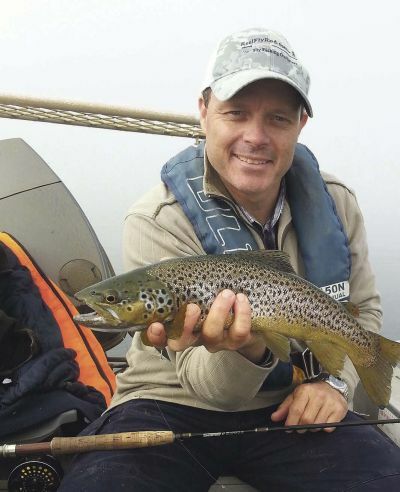 Great Lake can produce some superb dry fly fishing during the summer months and the best way to experience this, in my opinion, is from a boat. Once you have a boat on the water it opens up so many opportunities to find feeding fish. 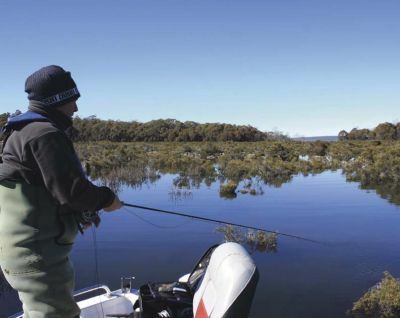 It also gives you the freedom to cover a lot more water to find fish as the conditions change. 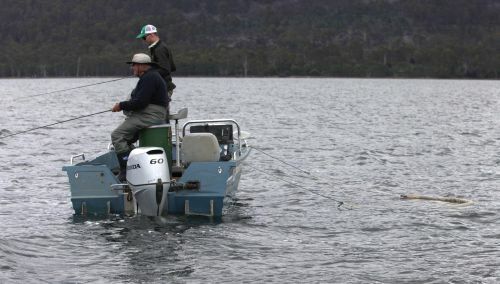 Many lure fishers started their fishing at Arthurs and consider it one of the most reliable fisheries in Tasmania. Professional lure maker Justin Causby gives his tips. Trolling on Arthurs can be broken down into three areas. Open water, structure and the Morass. I’m personally not one for trolling open water very often. The fish are out there, and they show in very good numbers in early mornings as they feed on midges from the evening and night before. But once the sun hits the water or the fog clears they go down, usually deep. You see very little sign of them on sounders despite seeing many scores of tell-tale rises all over the calm water at dawn. The season seemed to start a bit slowly on Arthurs Lake. The reports from the camp ground at Jonah Bay was that very few fish were caught on the opening weekend. The quiet word from inland fisheries was that there had been a good run of big fish, in the 4lb to 6lb in the first run of trout into Tumbledown Creek. None of these fish were in the 20,000 trout transferred to other waters; they finished their mating and returned to the lake to begin to put on condition for the coming season. Since the quiet start, the action has steadily improved; the continued high water levels have dropped somewhat but at the time of writing Arthurs is 1.1 metres from full and steady. The slightly lower level has sent trout out from the submerged kerosene bush into the weedy shallows, making them more accessible. Fish are easily seen chasing frogs in the shallows at low light and the caddis are thickening up and being regularly nipped off the surface. Mayflies are now hatching in good numbers. Lake Gordon is truly one of Tasmania’s forgotten waters. Visitation here would be one of the lowest in the state from our 20,000 plus licensed anglers. But given you hit this place at the right time it can turn on some very memorable fishing. Lake Gordon itself is an impressive piece of water. A 140m high concrete arch dam holding back a body of water with a surface area of 272 km 2 and an astonishing 11.9 cubic million litres of water. At the time of completition, despite a strongly led and backed protest from environmental groups, the Stage 1 Gordon River Development produced the single largest water storage and hydro electric scheme of its kind in Australia, dwarfing Lake Eucumbene threefold. Please note: there are lots of pictures at the end of the article. October, November what a great time of year to be fishing for trout around the highland lakes. 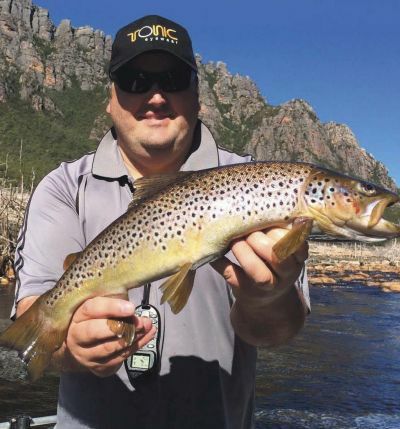 As spring progresses the weather is becoming more stable, temperatures are going up, both the air and water temperatures which in turn are making more food available for trout. The odd terrestrial beetle is getting around; aquatic hatches are commencing, midge, then the diminutive Stone fly, Caddis and then Mayfly. 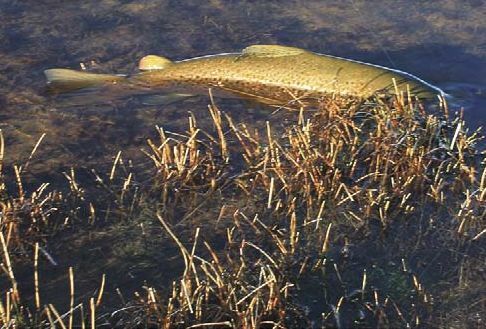 Trout aren’t necessarily hugging the bottom anymore and begin to freely rise when the food is there to tempt them to the surface. 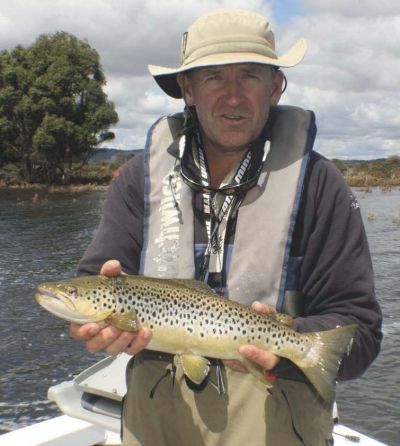 The beginning of the new trout season is finally here in Tassie! While temperatures are still very cold around the state, many anglers may choose to wait until the weather improves. For those keen anglers, such as myself, who remain undeterred by such weather conditions, the search for that first trout of the season begins. The Central Highland lakes are always productive early in the season and one of my favourites is Arthurs Lake. This season, I plan to explore more places on this lake using my Hobie fishing kayak. It really is the perfect craft to get into areas where boats can’t. I have also learnt that such ‘hard to reach’ places often hold the best fish.